Knowing how to clean your teeth with braces can help your orthodontic treatment stay on schedule and offer you the best smile results when your braces are removed. Neglecting to clean your teeth while wearing braces can lead to decalcification, which leaves white stains around your brackets that are visible when your braces are removed. These white stains are called “White Spot Lesions” and they are 100% preventable with good oral hygiene. Besides stains, there are many other preventable problems if you practice good hygiene. Knowing how to effectively clean your teeth can be challenging with an apparatus between you and your teeth surfaces. However, learning how to establish a new cleaning process will be worth it and will become much easier the more you do it! We all know that it’s good to clean your body very frequently so you don’t smell and so you feel and look good. The teeth are no exception. Poor hygiene will be noticeable, will damage your oral health (which could lead to problems such as gum disease and tooth loss), and will cause bad breath. You also won’t feel clean if your oral hygiene is lacking. What is the point of getting straight teeth if they are deteriorated or stained at the end of it all? 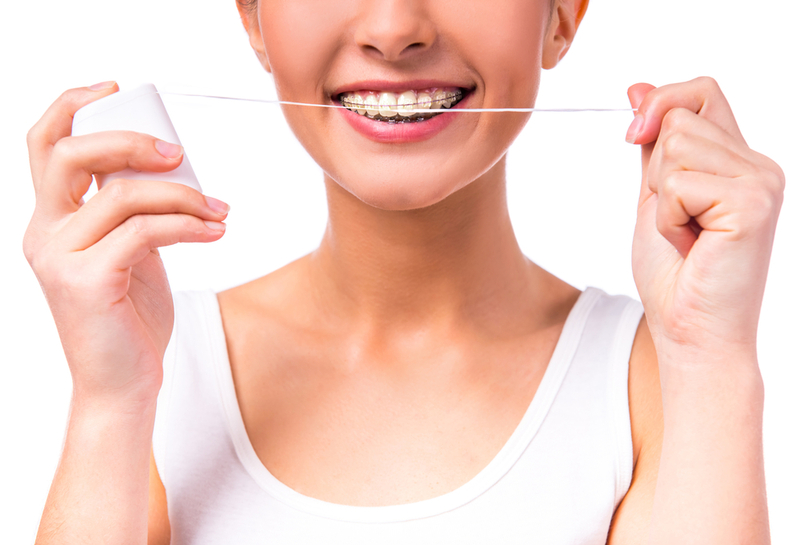 Keeping your teeth clean with braces is very similar to keeping your teeth clean without braces. You must brush several times a day (hopefully for 2 minutes at a time), use floss, and avoid drinks and food that can damage your teeth (such as soda or chewing on hard food). Cleaning teeth with braces only requires a little bit of extra effort, but the results of good oral hygiene are worth it. Decalcification: Like we said, not brushing your teeth or keeping them clean could result in white stains around your brackets that are visible when your braces are removed. Those lines are there for LIFE as well, so it’s worth taking the time to keep those teeth nice and clean. Enamel Issues: Not cleaning your teeth can result in a buildup of plaque and bacteria that eat away at your teeth. In some cases, teeth can crater or have holes in them if the enamel is already weak. Couple that with bad hygiene and it just spells disaster. Gingivitis: You’ve heard of gum disease but you might not know the signs. You probably won’t feel pain, but you’ll definitely start to notice swollen gums, bleeding gums (especially when brushing and flossing) and red gums. Gingivitis is known as gum disease and is the first stage of periodontal disease, which can basically recede your gums and lead to teeth loosening and tooth loss—yikes! Along with keeping your teeth clean, the gums are just as important! Periodontitis: This is that stage of periodontal disease we mentioned that comes after gingivitis. Gums can become inflamed and infected, and they will eventually recede. This can cause gaps in your teeth to form, and can even damage the ligaments and bones that support your teeth. Plaque Buildup: This goes hand-in-hand with enamel issues. If food is not cleaned from the teeth, it can build up and be a haven for bacteria. This will 1) give you terrible breath all the time and no one likes that, and 2) cause stains and tooth deterioration. Speaking of plaque, this is one of your worst enemies when it comes to oral hygiene. Plaque is sticky residue that coats your teeth and builds up from the food you eat and the things you drink. Bacteria is highly attracted to it, and not cleaning your teeth can result in the problems we mentioned above. Just a few minutes a day keeping those gums and teeth free of plaque will save you a whole lot of hurt (especially with cavities and oral problems) in the long run. Floss every day—twice a day if you can. Brush, brush, brush! Grab a toothbrush and brush twice a day (at least). The best plan would be to clean after every meal, but if not, then shoot for the daily minimum of twice a day. Rinse your mouth out with water before your brush to dislodge food. Then start out brushing at the gumline (where plaque likes to hang out) and work your way to the bracket. Rinse your mouth out again after brushing. Use mouthwash! Not only will the mouthwash kill bacteria, but it will give you fresh breath and get into spaces you can’t even see. Use an electronic toothbrush. If your brushing is getting monotonous or you want to get each bracket cleaned more thoroughly, an electronic toothbrush can help do even more work than a standard. Use a fluoride treatment that is recommended by your dentist or orthodontist. This can help keep your teeth strong. Clean your gums and brush your tongue. You can still have tons of bacteria floating around in your mouth after brushing. Make sure your gums are free of food and kept clean. Brush your tongue often to get rid of all the remnants of food that attract bacteria. You’ll notice a cleaner feeling in your mouth afterwards. Use flossers to get in between brackets and soft picks to get food stuck in hard to reach places and in the brackets. Brush your teeth at a 45-degree angle to get all parts of the brackets clean and be sure you haven’t missed anything. Call Belmar Orthodontics today at 303.225.9016 to schedule a healthy teeth consultation. We are happy to answer any questions you have!